Since it was first introduced in 1979, the Canadian Gold Maple Leaf series of coins has been one of the most popular in the world. Part of the reason this series is so popular is due to the fact that these gold coins are offered in a number of different sizes. 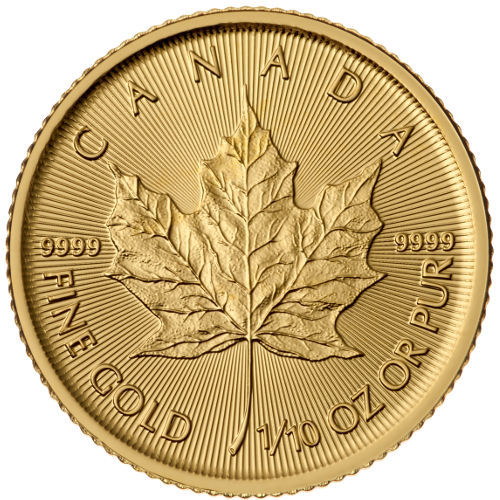 Though 1979 saw only 1 oz Gold Maple Leafs produced, three years after the coin’s inception it was offered in more sizes — including the 1/10 oz size. More and more often investors are buying gold in fractionals to meet their needs because of their divisibility. Gold spot price changes frequently, but can always be divided or multiplied to get your fractional piece’s spot value. Multiples of 20 ship in sealed mint sheets. Other quantities ship in individual plastic flips. Contains 1/10 troy oz of 99.99% pure gold. Minted at the Royal Canadian Mint in Canada. Face value of $5 CAD. Obverse design created by Susanna Blunt. Arrives in Brilliant Uncirculated condition. Though simple, the design of this coin is incredibly beautiful and one that is near and dear to the heart of every Canadian. The reverse side of the coin is dominated by the central image of a maple leaf, which is raised from the coin’s face to give it a textured feel. The maple leaf is depicted in such detail that even the creases of the leaf are able to be seen and felt. Accompanying the image of the leaf are purity and weight indications. 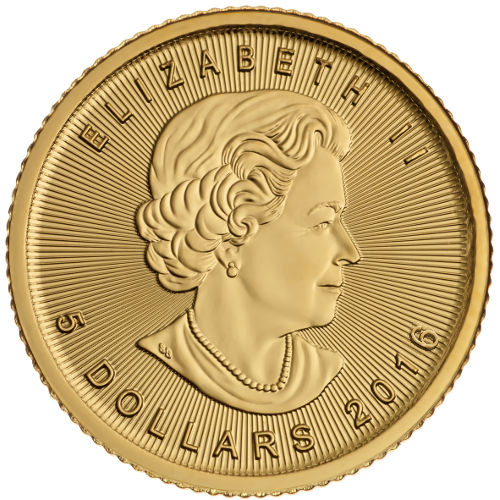 The coin’s obverse side depicts Queen Elizabeth II facing rightward. Like the leaf, the image of the Queen is struck with extreme attention to detail. Beneath her image you will find the CAD$5 face value that the coin carries. The coin is equipped with reeded edges, much like many of the coins produced by Canada’s United States neighbor. 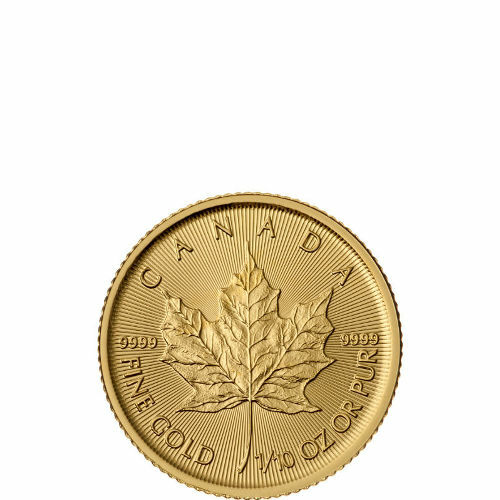 With regard to purity, the Gold Maple Leaf is minted with 99.99% pure gold, making it one of the purest coins on the market today. Additionally, we sell these coins in Brilliant Uncirculated condition which means that they were never touched by human hands and are in the best possible condition. For collectors, the condition of the coin means everything so we ensure that you are only receiving the best possible pieces to add to your collection. 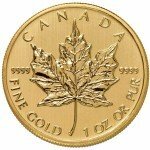 As a coin that is popular amongst both collectors and investors, it is easy to see why the Gold Maple Leaf is one of the most popular coins in the world. If you would like to learn more about the Gold Maple Leaf coin series, we suggest that you direct any and all inquiries to our helpful customer service staff at 888-989-7223. You can also get in touch with customer service via live-chat and email. If you are interested in similar products, be sure to check out our full selection of Gold Maple Leaf Coins.